The settlement which came to be Novi Sad (German: Neusatz, Hungarian: Ùjvidék) was first mentioned in historical documents in 1692 in connection to a bridgehead at a Danube bridge. The Petrovaradin head was populated by soldiers who had to defend the border of the Austrian Empire against the Ottomans. Over the years, houses were erected on pillars around the bridge and the inhabitants – mostly Serbians and Germans – made a living from trade and craftsmanship. In 1748, the citizens of Novi Sad bought the status as a royal free town and the city saw a rapid economic growth. At the same time, the name was changed into Neoplanta in Latin, Újvidek in Hungarian, Neusatz in German and Novi Sad in Serbian. Early on, Novi Sad was not only settled by Serbians, but by Germans, Hungarians, Jews, Greeks and Armenians as well. From the second half of the 19th century, the city was known as a centre of education of Serbians in Hungary and its manifold publishing industry. For that reason, it came to be called “Serbian Athens”. Novi Sad was a city of medium size. During the Hungarian Revolution against Habsburg, great parts of the city were destroyed in 1849. Afterwards, Novi Sad developed from a settlement with baroque architecture into a modern middle-European city. Thus, the city was not only populated by merchants from the region but also by families from the whole of the Empire in the late 19th century. The second half of the 19th century shaped today’s face of the city. 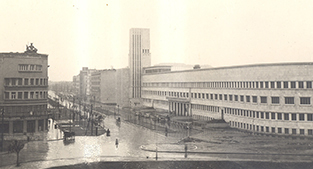 The new town hall, the Catholic church and various other grand buildings such as the former provident bank, the Grand Hotel Maier, the Matica Srpska building or the Hotel Queen Elizabeth were built. On Herrenstraße, splendid palaces were built and the new synagogue was finished in 1908. 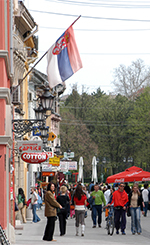 After World War I, Novi Sad became the capital of Bačka in the newly founded Kingdom of Yugoslavia. In 1929, the city became the seat of Danube Banovia. Due to this status and the mercantile skills of Novi Sad’s inhabitants, it turned into the leading city of the region and consequently became the seat of the self-governed province of Vojvodinan in 1944. Today, Novi Sad has 350.000 inhabitants and is the second largest city of Serbia. Its attractive location with a promenade that connects the city centre and the popular Danube beach; the view of the right Danube shore, the Fort of Petrovaradin, the fish pond and the hills of Fruška gora are only some of the strongpoints of the city, which is more and more discovered by tourists. 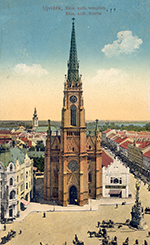 RIGHT: Novi Sad’s Catholic church around 1910. 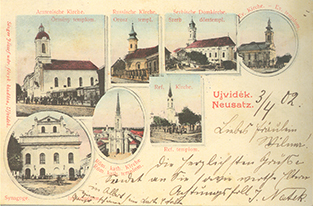 The many religions and churches of Novi Sad united on one postcard.